Alastair Lovell from off-grid energy specialists Calor explains why you can count on Calor to ensure you should never run out of fuel. 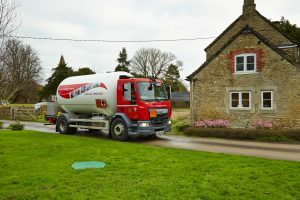 If you’re renovating a rural home without access to mains gas, the possibility of being left without any fuel for your home heating and hot water may be a concern. So when deciding on your off-grid energy, you’ll want to take into account the security of supply offered by different types of fuel and the companies that provide them. After all, you don’t want to be left without any heating in the middle of Winter. LPG is often considered a more secure fuel in comparison to oil, as it is virtually impossible to steal as highly specialised equipment would be required to extract the gas from the storage tank. Calor tanks are also fitted with a clever telemetry system, which monitors gas levels, fitted at no additional cost to you. The system automatically reorders a gas delivery when the gas level is running low ensuring a readily available gas supply at all times – meaning you don’t need to worry about being left cold without heating. What’s more, LPG from Calor offers security, as the company has the UK’s largest LPG tanker fleet, plus UK gas storage facilities, meaning they should be able to get the gas to you when needed – no matter what time of year it is, or how bad the weather gets. When Stephen Price moved to his dream home in a small corner of the Brecon Beacons near Abergavenny, he never considered that his LPG fuel supply would be at risk. But when his supplier let him down and he ran out of gas, he decided it was time to switch. Stephen got in touch with Calor to see if they could help, and with just one phone call, the process was underway. Calor managed the entire switch for Stephen, including liaising with his previous supplier and arranging to take ownership of the tank. Even better, while the switch was underway, they also made sure Stephen received a swift delivery of LPG, so that his family were not left without heating and hot water at the coldest time of the year. “I was very surprised because when I compared the difference in price between a number of different gas providers; Calor’s was not only reasonable, but it actually beat the competitors”, says Stephen. For more information on switching your fuel or provider to Calor gas and to find out about their latest offers, visit www.calor.co.uk or call 0800 181 4523. Next Post When is a conversion not a conversion?